SeroTin is a 100% natural anti depressant supplement that helps bring relief from depression, anxiety, and stress for men and women. It has been developed as a complex formula that is a blend of natural herbs and remedies. 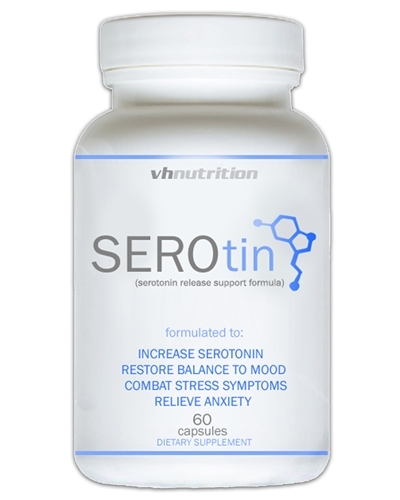 SeroTin aims to boost serotonin levels and decrease cortisol levels. Serotonin is the chemical in your brain that allows for anxiety to be managed and keeps you calm even under intense situations. Cortisol is the hormone that triggers the fight or flight response in your body. This response brings adrenal fatigue and causes lasting depression and anxiety which is why blocking cortisol production is an important element in developing a cure for depression and anxiety. Panic attacks arise when your system is over loaded with cortisol and is overwhelmed by outside stimulus. SeroTin supports your body's ability to manage stress and works to keep you calmer as you engage in situations that would normally lead to panic attacks. 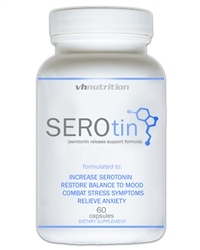 SeroTin is your tool to help you overcome depression, anxiety, and high stress. Take one serving (two capsules) with 8-10 ounces of water once daily. For improved results take one serving twice daily in the morning and afternoon with 8-10 ounces of water. This statement has not been evaluated by the FDA. This product is not intended to diagnose, treat, cure, or prevent any disease. The statements made on this page are not intended to be construed as an anxiety cure or as medical advice. Actual product packaging and materials may contain more and different information than what is shown on our website. We recommend that you do not rely solely on the information presented and that you always read labels, warnings, and directions before using or consuming a product.